On May 23 each year, unless it falls on a Saturday or Sunday, Jamaicans celebrate Labour Day by volunteering their time and energy towards the beautification and enhancement of communities across the island.A national holiday, Labour Day has been officially recognised in Jamaica since 1960. However, it was the events of 1938 which opened a new era in the life of the working man of all classes and brought about a fundamental change in the relationship between the workers and their employers in Jamaica. From this change emerged a new order of effective trade unionism which would eventually lead to the formation of Jamaica’s two main political parties and ultimately to its Independence from colonial rule. Ever since 1939, Jamaica has paused on May 23 to recognise the value of work and the immense contribution of the workers to the development of the country. Up to 1960, May 24 was observed annually in Jamaica as Empire Day, the birthday of Queen Victoria, who was deeply concerned about human liberty and has been credited with granting slaves in Jamaica and the rest of the British Empire their freedom. Instituted in the United Kingdom in 1904, Empire Day extended throughout the countries of the Commonwealth. It gave the Queen’s people a chance to show their pride in being part of the British Empire. School children were required to attend school on the morning of the holiday to participate in flag-raising ceremonies and in the singing of ‘Rule Britannia’, the British national anthem, ‘God Save the King’ and other British patriotic songs. display on Empire Day in 1944. By the 1950s however, the British Empire had started to decline and Britain’s relationship with countries that formed the Empire such as Jamaica, had also changed as they began to celebrate their own identity. In 1958, Empire Day was renamed Commonwealth Day, in agreement with the new post-colonial relationship between the nations of the former empire. In Jamaica, by then, May 24th was already being celebrated informally as Labour Day, in commemoration of the labour upheavals which took place between May 23 and June 6 of 1938. 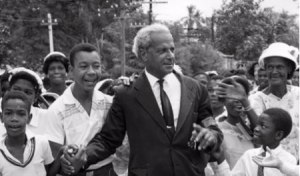 In 1960, the then Premier, the late Right Excellent Norman Washington Manley, presented a bill in Parliament which finally abolished Empire Day. On June 15th, a law to amend the Holiday (Public General) Law received unanimous support in the Legislative Council. May 23 was now to be known as “National Labour Day” and officially marked the anniversary of the first wave of working class strikes which took place in 1938. Empire Day in favour of “National Labour Day”. 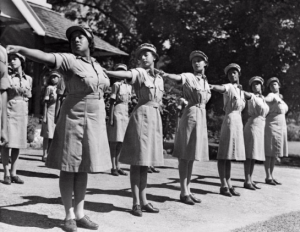 The labour movement in Jamaica has its origins in the struggles of the workers in 1938 for better working conditions. After fatal riots in Frome, Westmoreland and the arrest of labour leader Sir Alexander Bustamante along with Garveyite Sergeant William Grant, the time was ripe in Jamaica for political change. It is from this movement that Jamaica’s two major political parties emerged and the journey to Independence began. The focus of Labour Day had now shifted from the tradition of gratitude to colonial masters, to political Independence and the importance of trade unions. In 1938, under the patronage of Sir Alexander Bustamante, the Bustamante Industrial Trade Union (BITU) was formed and set out on the dedicated task of taking care of the welfare of Jamaica’s workers. Despite minor setbacks, the union, which bears the name of one of Jamaica’s greatest labour leaders, contributed to the rise in the wage structure in the island as well the consequent increase in the standard of living. The benefits of annual vacation as well as sick leave with pay were also introduced to Jamaica by the BITU. collaboration with their political parties, in the form of public rally meetings and marches. There were occasions, however, when the marches of the opposing major trade unions and the political parties clashed. In 1962, a JLP-BITU and PNP-NWU clash during the Labour Day march resulted in the death of a woman and the injury of over a dozen police officers who had to resort to tear gas to quell the disturbance. This was contrary to the original concept of Mr. Manley that the day should be a demonstration of unity among workers in Jamaica. In 1966 the Labour Day marches were banned in the Corporate Area as a result of disturbances which took place in early May of that year. Since then, the police refused to grant permission for marches to either trade union. The following year, workers and employers from every field of activity in Jamaica convened in an atmosphere of conviviality as the then Prime Minister, the Hon. Hugh Shearer, on behalf of the Government of Jamaica hosted a glittering reception at Jamaica House in celebration of Labour Day. Without the grandiose marches which saw the opposing trade unions meeting in the streets of Kingston, Labour Day was marked by services, public meetings and protest rallies and minimal incidents for the next few years. The mantra ‘Put Work into Labour Day’ was both an expression of thanksgiving and a call for national unity. In 1972, the then Prime Minister, the Hon. Michael Manley, infused the national holiday with a new dimension by expressing to all Jamaicans the importance of labour to nation-building through voluntary community work. It was the first time Jamaicans were asked to give up a part or all of their public holidays to work on a community project. The Palisadoes Road (now known as the Norman Manley Highway) was selected as the first site where the Prime Minister was seen clearing land and planting trees to beautify the area. His invitation to the nation resulted in a tremendous national response and 600 projects, mainly of a beautification nature, were identified across the island. work, it also contained other ideas. It identified and stressed a part of the future policy of the Government – that of appealing to the national pride, interest and dignity of the people and mobilising them on an island-wide basis. Groups and individuals around the island followed the Prime Minister’s lead and planned projects of their own, such as the refurbishing of schools, community centres, state institutions and other public and private buildings. Since then, Labour Day has not only been a public holiday but also a day of mass community involvement around the country. It has evolved out of the struggle to free workers from the extreme conditions of repression, exploitation and racism. In 1989, after an eight year absence of wide scale island-wide Labour Day projects, the Jamaican government introduced themes as a guide for persons to assist in Labour Day activities. The identification of a theme was meant to foster wider national involvement and solidarity but did not compel citizens to be bound by the theme. These themes have included a wide range of issues such as health and the environment, youth and the community, respect for the elderly and vulnerable, road safety, and the planting of trees. While still managing to maintain its original connection to the trade union movement, Labour Day exemplifies the dignity of labour and the importance of volunteerism towards community development as Jamaicans join together to invest their energies towards the cultivation of a prosperous country.